The Ghost of Oakhill Park. Oakhill Park is known for its football pitches, Bowling Green a childrens playground and of course the East Barnet festival that is held there every year. But did you know that it also had a ghost? The local newspaper, the Barnet Press, wrote, "Headless hounds, decapitated bodies, spectres in the trees - the list of ghostly experiences at Oak Hill Park in East Barnet seems to go on and on." Many years later and his grandson, also named Sir Geoffrey de Mandeville, was awarded the title of Earl of Essex by King Stephen. By 1141 Sir Geoffrey had become the most powerful baron in England but it was not long before he fell out with Stephen. Once his friend he was now his enemy and he became an outlaw. In 1144 Sir Geoffrey was slain by an arrow in a skirmish against the king but because he had been excommunicated he was denied a Christianity burial so his body was wrapped in lead and taken to the Templar community in London. He was buried in the Temple Church in London (which was featured in the Da Vinci Code) and you can still see an effigy of him on the floor of that building. Why he decided to haunt East Barnet (it is also reported that he haunts Hadley woods) is a mystery and why people have thought he was Sir Geoffrey is also strange. Perhaps a different view would be that he was one of the knights at the Battle of Barnet which would be a better reason for why he is a knight and also have link to Barnet history. Who ever he is he is not the only ghost that apparently visits our local park. Church Hill Road, which runs along side Oak Hill Park, was known as "The Ghosts' Promenade", because of the many supernatural sightings. Although I can find no other named ghosts (other than Sir Geoffrey) reported as haunting the park there must have been more sighting over the years for it to get such a reputation. There was in fact another strange incident that happened in Oakhill. In the early 1930s an old oak tree in the Park burst into flames on a clear summer day. No one knew what caused it but this particular tree had a story as it was the actual oak tree under which the famous 18th century religious prophetess Joanna Southcott 1750 – 1814) used to sit during her many visits to friends in East Barnet and it was here that she had many visions. She was such an eccentric that at the age of 64 she announced she was going to give birth to a Messiah but she died shortly after that without fulfilling her prophecy. 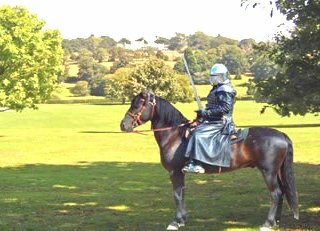 So be careful if you take a short cut through the park, especially if you have had a few too many at the Prince as you just might come across a man on a horse whose spirit lives on.